Brief Synopsis – After two strangers meet and start to fall for one another, they begin to wonder whether they are meant to be together and decide to let fate step in. My Take on it – This is one of my favorite rom-coms because it tells an amazing love story with a twist. How much influence do we have on our own lives? Do we control our own destiny? Does the universe send us signs to help direct us? There are some of the important questions that this movie posits. 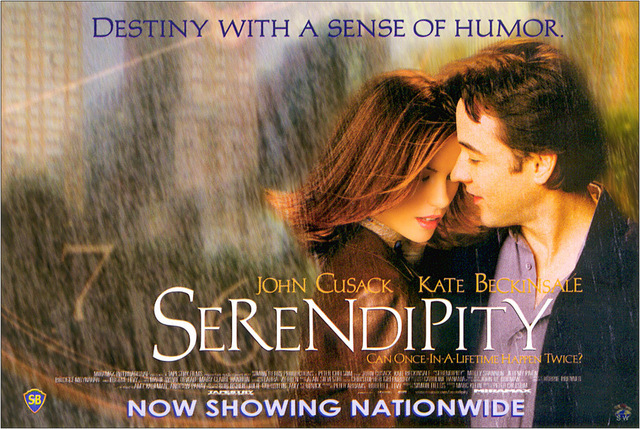 As the romantic lead John Cusack and Kate Beckinsale have great chemistry together. But more importantly Cusack has great Chemistry with Jeremy Piven and Beckinsale works great with Molly Shannon. I love the music in this movie and even own the soundtrack. Bottom Line – Great rom-com that asks the question of how much fate and divine intervention play a role in our lives. Great chemistry among the cast and excellent music. Highly recommended! Great post! I found this movie so stretched out and exhausting. It was one of those cases where I was desperately wishing it would just come to an end. Eventually I couldn’t care less if they ended up together. I liked it. I am a romantic and I like it when there’s genuine chemistry between two characters. I could have strangled that brat in the lift haha.